Being among the most crucial raw materials that you can have, there is no doubt that you need to make sure that this ends up doing the job that it is meant to do. The only problem is that with thousands of contaminants that can get their way into the water that you drink or use in your household, it is virtually impossible to ensure that the water you use does not harm you. However, with a good RO filtration system you stand a better chance of being able to make sure that your water is much safer and much cleaner. One of the reverse osmosis systems that strikes a lot of trust among users is the iSpring RCC7AK. The system is completely built by a top rated USA brand that has been in operation since 2005. This ensures quality and top performance at all times and invokes trust with users because of the rigorous processes that products have to go through before they can be released. Aside from the quality that is evident with the iSpring RCC7AK, users are also able to enjoy the noise-free and the problem free operation. You do not have to contend with constant break downs not even the constant buzzing that can be quite a nuisance. Not only does this offer for a great user experience, it also allows for less infringement of space and nuisance. 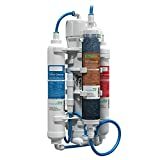 The system comes fitted with a 6 stage filtration system that ensures that 100% of macro particles like dirt, rust and silt and 99% of micro particles like the chlorine and even taste are eliminated together with thousands of other contaminants that can find their way into the water that you drink. The best part about the iSpring RCC7AK is that it has upgrades that are available since July 2014 that include designer faucets, brushed nickels and ceramic valves. However, these are not included in the initial purchase and require you to make an added investment but provide for plenty of convenience. It features a larger membrane square footage that allows for more water to be processed. This translates to about 75 gallons per day as opposed to the usual 50 GPD. The larger membrane means that you get a full tank faster and for longer and any concerns of running out of water are taken out of the picture. Not only are you able to filter the water you use with the iSpring RCC7AK, it is also able to replenish the water with the vital minerals that are removed during the filtration process. This means that you do not get clean water but water that is also fortified with the right minerals that promote better health. Upon purchase, the user has a 30 day money back guarantee in the event that they are not satisfied with the services that the iSpring RCC7AK has to offer. Additionally there is also a 1 year satisfaction guarantee that comes with every purchase as well as a lifetime of free support for the equipment. Even though the installation is quite simple the company does not take any chances and has a video up on YouTube to ensure that the user does not have to endure any trouble whatsoever. The iSpring RCC7AK is a good replacement albeit it might be a more costly solution. It has the same robust 6 stage filtration system but does not mineralize the water. Another option that could come in handy. 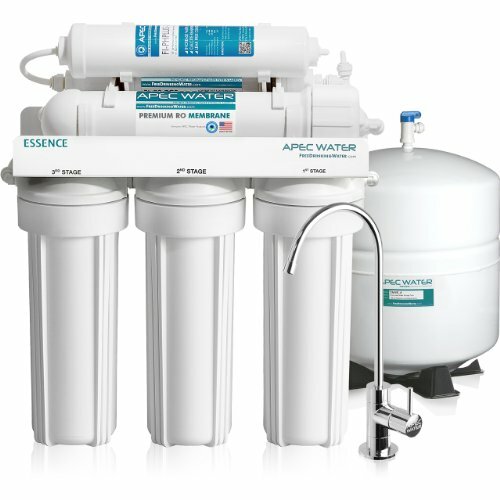 If you are looking for something that has a much faster production rate, then the Home Master TMAFC Artesian is an ideal option especially considering that it has double the water flow rate with longer lasting filters. The best part is that it is also able to mineralize the water though it is more expensive but delivers. If I would have written a review for this product last year, I would have easily given it a 5 star review. 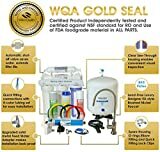 It was not too cumbersome to install, it made our water taste great, and I loved the money we were saving since we stopped buying bottled water. Unfortunately, things went really downhill after the first three months of usage. My husband started complaining about the taste of the water, and I thought it was just in his head. However, I started noticing a metallic taste again, too. I purchased a new filter and changed it, and the water immediately tasted find again. Of course, I was disappointed because the filter was supposed to last longer than that, but I thought it was just a fluke. After 2 1/2 more months, we had the same issue again. I’m pleased with the system itself, but I did not expect to have to spend so much money replacing the filters every 2-3 months. After researching for almost a year, I decided that I no longer wanted my children to be consuming fluoride in their water. I know that everyone has different opinions on this, but this is a decision that my wife and I came to for our family. We chose the iSpring 6 Stage Reverse Osmosis System, and we have been thrilled with our purchase! No system is perfect, but this provided all of the features that we needed and wanted at a reasonable price. I believe that this system was an investment in our health instead of just an investment in our home. Shipping was quick, and the packaging was very thick and sturdy, so it arrived undamaged. Installation took me several hours, but that’s mostly because I checked and re-checked every step. I was happy to find out that the included parts fit my existing piping, so I didn’t have to spend any extra money on new pipes or fittings. Almost immediately after installation, I tested the water, and I have continued to do so once a week. Not only does our water taste great—the pH levels are always optimal, and I love knowing that my kids are not constantly consuming fluoride every time they get a cup of water.